Please use the size chart below to choose a size based upon your US size. Or choose the European size you normally wear. We tried on a selection of these and thought they match the chart well. The width is “medium” or D.
If anything, we thought the boots fit on the snug side, so if you are between sizes in the chart, we’d recommend you try the larger. The Germain Gore-Tex boot is a boot for the motorcyclist office worker! And right now, our remaining stock is on closeout. These boots have motorcycle protection features but are made to look like stylish dress boots. I was pleasantly surprised when I saw these Germain boots in person. The factory images make them look a bit inexpensive, but in person, they looks much better. The leather used is a high quality with a nice finish. On the toe, there is a SLIGHT etched pattern where the shifter pad might be. But from a couple feet you won’t even notice it. To be honest, I really can’t figure out why they added the etching, but anyway, its not going to protect the smooth leather from your shifter. To keep the boots looking nice, you might want to get some padding around the shifter. If you work in an office and ride to work, you’ll probably already know what to do. The basic cut of this boot is just like most high quality dress boots you’d wear with a suit or slacks. They’ll be perfect for business casual or dress environments, so those who ride to work will love them. These boots are waterproof too with a Gore-Tex membrane so you can wear them on the bike and if it rains, no problem (at least for your feet!). The sole of this boot is more sturdy than you’d think… it has some stiffness and some sort of shank to keep it rigid between the heel and the foot (important in motorcycle boots). For armor, the boots have moderate stiffness in the toe and heel area and there are hidden protectors over each ankle bone (even on the zipper side). 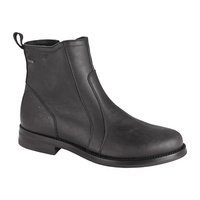 Dainese says: Germain GORE-TEX® ankle boots were designed for city professionals and never go unnoticed whatever the city. Made from soft but resistant full grain GORE-TEX® cowhide, these boots are CE – Category II – Directive 89/686/EEC certified. They come with various technical components which do not affect the overall elegant, fashionable look such as rigid inserts at the heels, reinforced insoles, a waterproof, breathable GORE-TEX® membrane and laser cut inserts.